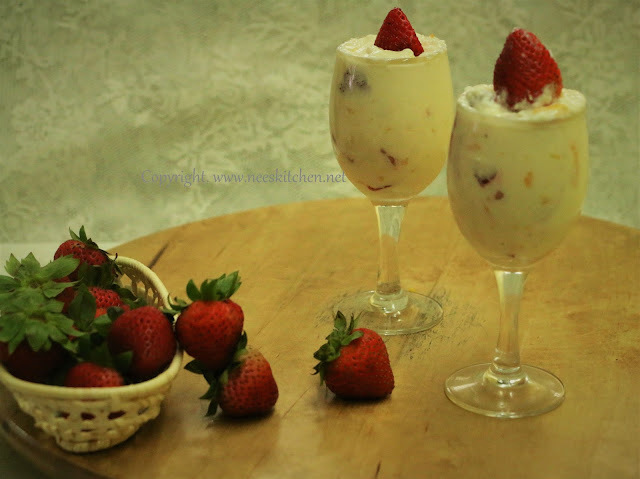 Cream cheese & cooking cream blended with honey, orange rind & vanilla essence and finally mixed with strawberry chunks gives this yummy dish which tastes almost like an ice-cream. 1. Cut sweet strawberries into 1 inch cube upto 1 cup size. 2. Rind the skin of oranges by grating it with a grater. 3. Take cream cheese and transfer it into a container. Add Cooking cream to it and blend them using a hand blender or cake mixer. 5. Add Vannila essence , honey blend for 30 seconds so that I will get mixed nicely. 6.Add Orange Rind and mix well. 7. Add strawberry and mix it nicely with cream using a spatula. You can replace strawberries with raspberries. You can replace honey with sugar if you want this to be too sweet.